Sport and Religion have a long history of being intertwined. The ancient Panhellenic Games of which the Olympics was one were, after all, religious festivals. 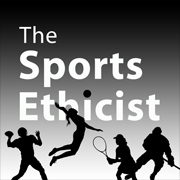 There are many interesting issues regarding the intersection of sport and religion: what ought to be the mix? Is it wrong to pray for the other team to lose? Is it a form of cheating to pray for divine intervention? Foster’s public announcement brings another issue to the fore: will sport communities accept an open atheist? Foster is the first active professional athlete to give public voice to his lack of religious belief. And he does so in a sport that seems the most religious (though I think baseball is darn close). Foster’s interview shows that he is intelligent, sensitive, and reflective. He is not seeking affirmation or looking for a fight. He is just explaining a part of himself and his view of the world. The two obvious comparisons to Foster’s announcement that jump out are Tim Tebow and Michael Sam. Tebow, because of his outspoken Christianity, and Sam because he was the first openly gay active professional football player. However, these comparisons are not quite fitting. The comparison to Tebow really only comes up because this is about religion. Otherwise, there are not many parallels. Tebow never had to ‘come out.’ He never had to feel that he had to hide who he was out of fear for being ostracized by his teammates, community, or fans. I am sure Tebow didn’t always feel entirely welcomed or free to speak his mind in full because he was so much more outwardly intense in his religious views, but not feeling entirely welcomed is not quite the same as being ostracized or treated as a pariah. Some might claim Tebow didn’t get a fair shake in the NFL because of his outspoken religious views. But the Tebow circus was more about his lack of NFL QB ability, not his religion. (Foster, on the other hand, doesn’t face that issue; he is unquestionably one of the top RBs in the NFL). Michael Sam’s coming out moment was, I think, of much more historically significance. Homosexuals still face odious persecution and violent treatment in this country and much worse elsewhere in the world. Religion (or one’s lack of it) is of course controversial, but when you get to things like sexuality, gender, or race that’s a whole different level of controversy. So many just don’t seem able to talk rationally or deal with these subjects in direct and candid ways. So coming out as gay puts much more at stake than announcing one is an atheist. Another disanalogy here is that Sam came out at the start of his career and his professional football capability is still yet to be established. Foster is at the peak (maybe just past the peak) of a great career in the NFL. Nevertheless, the parallels between Sam and Foster are worth pointing out. Atheists are still persecuted and singled out. In parts of the world, atheists are still put to death. And persecution happens here in the States as well, as attested by this story about a 7-year old punished in a public school for telling one of his classmates that he didn’t believe in god. Atheism and homosexuality also pose similar challenges to aspects of the dominant cultural norms of the NFL locker rooms and its public image. Michael Sam and Arian Foster both face rejection by their teammates, community, and fans. The potential backlash or rejection of Sam is probably more significant than Foster, for many reasons: Foster is already established, Sam’s announcement was near the draft and got a lot more attention, sexuality issues are more salacious and get more media attention, etc. I don’t want to overplay the parallels here, but I do think Foster’s public announcement is significant. It opens the door for others—both in and out of sport—to be more open about their lack of religion. It can help raise awareness about atheism and undo many of the stereotypes and misunderstandings. Sport can be a powerful force for social change, and it is often at the forefront of such changes. I hope Foster’s announcement can be a part—even if just a small part—of that positive historical pattern for sport.